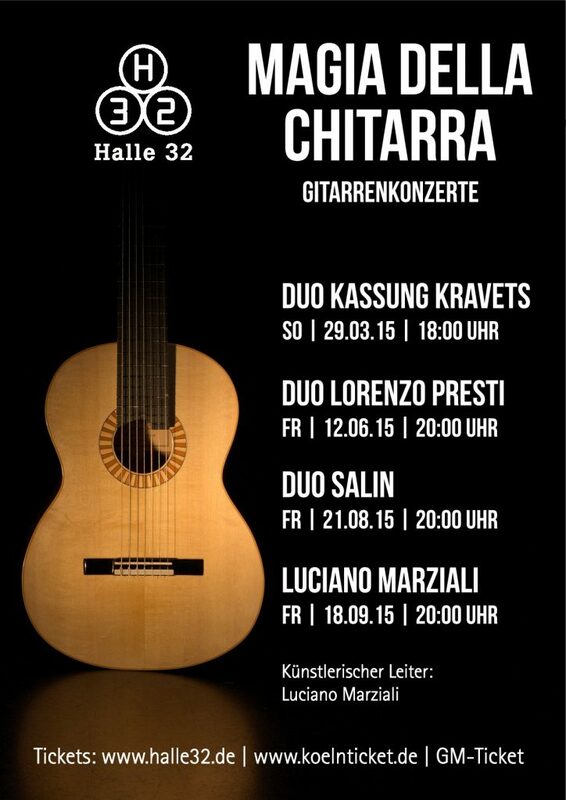 Luciano Marziali is used to propos recital programs, in which all pieces refer to a general main topic. 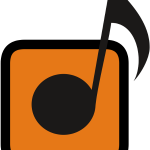 This main content can be for instance stylistic (with music from the same period or by only one composer) or geographical (with music from the same country) or chronological (with music from different centuries, usually from the beginning of classical guitar music till nowadays). Additional to this aspect Luciano Marziali chooses his programs to fit out the type of event and public. 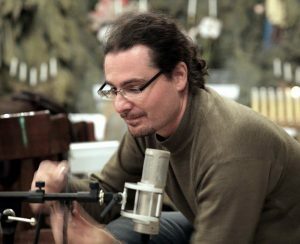 The satisfaction of the public, both music experts as well as non, is the all first priority for Luciano Marziali not only during the performance but also in its preparation phase. 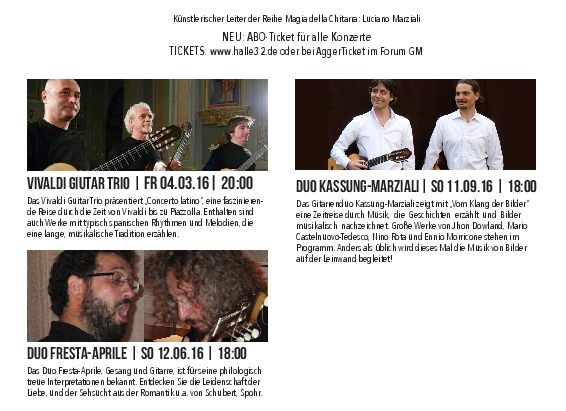 Here below you can see some examples of Luciano Marziali’ s actual concert programs. 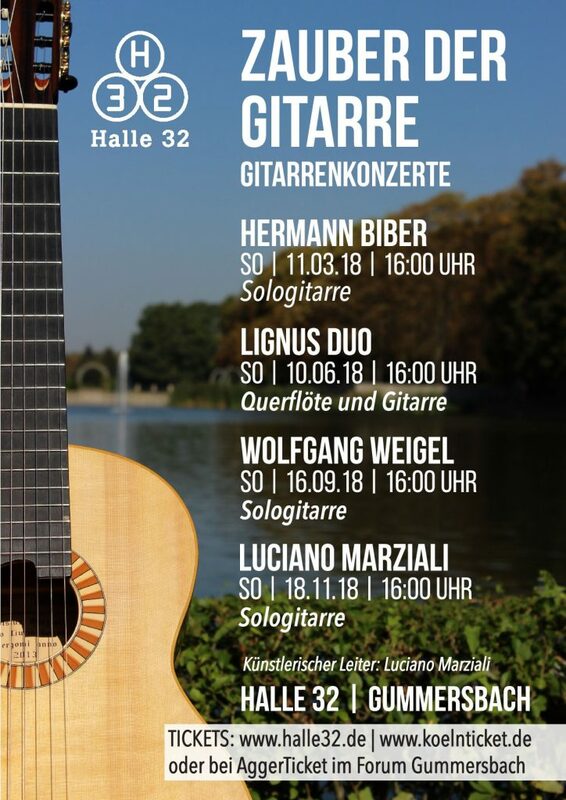 In addition to his concert activity Luciano Marziali has been teaching the art of playing the guitar for over twenty years, both privately and in various European master classes and guitar festivals. 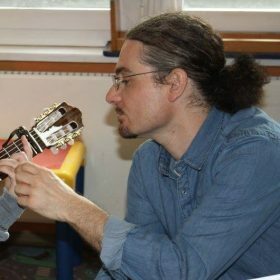 A lot of beginners have developed thanks to the joint work with Marziali a deep passion for the instrument and advanced pupils have been successful in the entrance examination in music schools in Germany, at the Conservatory in Italy and in several international guitar competitions. 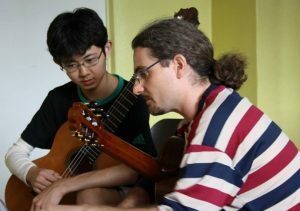 Luciano Marziali supervises regurarly music students during their preparation phase for instrumental examinations. Thanks to his long experience in live performing Luciano Marziali can help not only in the interpretation but also in the compilation of the examination’s program and above all in its performance on the stage. This last point is often neglected und can become the reason of non-optimal exam results: just an interesting, convincing and enjoyed performance deserves the highest marks! 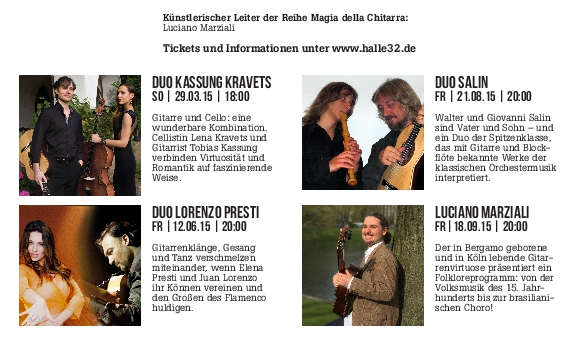 Luciano Marziali is regular teacher at the Rheinische Musikschule in Cologne – Germany. If interest should exist for a private trial lesson with Luciano Marziali, please communicate it. 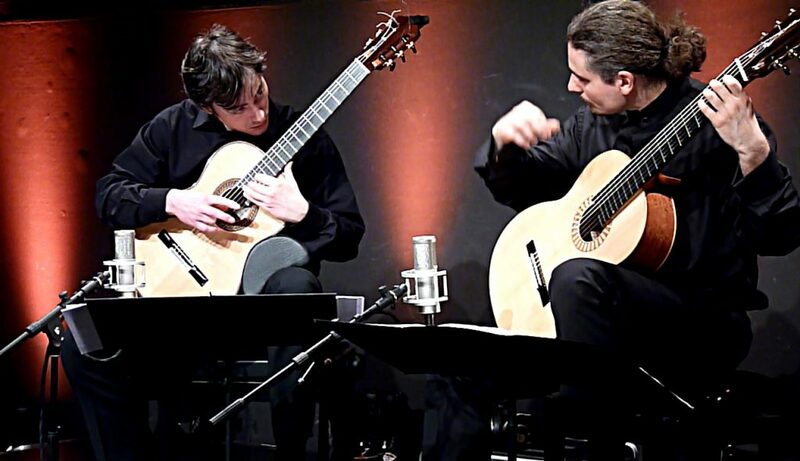 Tobias Kassung and Luciano Marziali met each other during their studies at the Hochschule für Musik und Tanz Köln (Cologne). 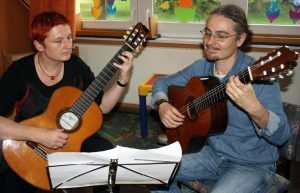 Kassung expands as a guitarist, composer and director of the Kölner Klassik Ensemble untiringly the guitars possibilities. 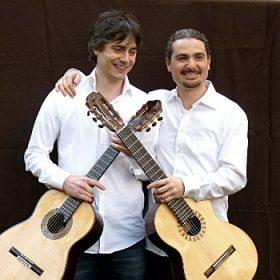 As well as Marziali, who took the initiative to establish the duo, after his father developed together with him and then built a 7-strings guitar in 2008. With this instrument the duo is able to play repertoire normally impossible to perform. Their current programme Il Cinema focuses on famous cinema compositions by the great Italian composers Mario Castelnuovo-Tedesco, Nino Rota and Ennio Morricone and includes works by John Dowland and Johann Sebastian Bach which were used as sound track in several movies. 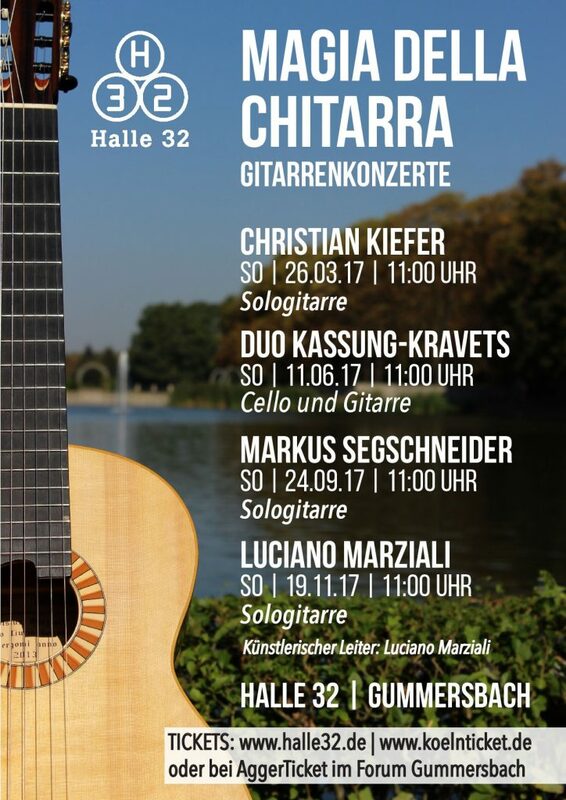 All the pieces were arranged by Tobias Kassung and Luciano Marziali for this particular combination with 6- and 7-strings guitar. 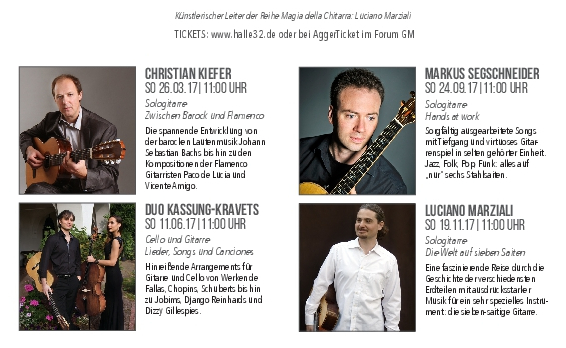 Since 2015 Luciano Marziali is leading the concert series Zauber der Gitarre (Magic of the Guitar) as artistic director in Gummersbach – Germany. 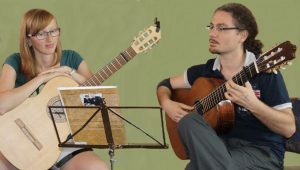 The goal is to present not only the classical guitar and its repertoire but also other music stiles in which the acoustic guitar is playing a fundamental role. 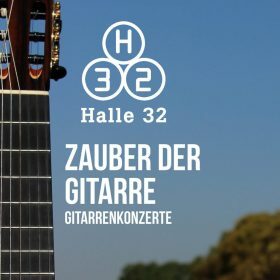 The concerts take place in the wonderful hall Halle 32, an industry building from beginning of the 19th century that was renewed in 2013 for cultural proposals. 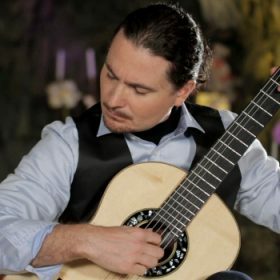 Luciano Marziali and his colleague Jhon Jimenez created in 2014 Guitar TV World, which is an online music channel dedicated to the beautiful world of the guitar. 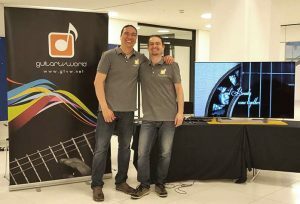 Main objective of Guitar TV World is to offer programs of great interest within an artistic and professional concept while we carefully work on video and audio using high-tech equipment to produce high-definition materials to further spread the appreciation for the guitar throughout the world. 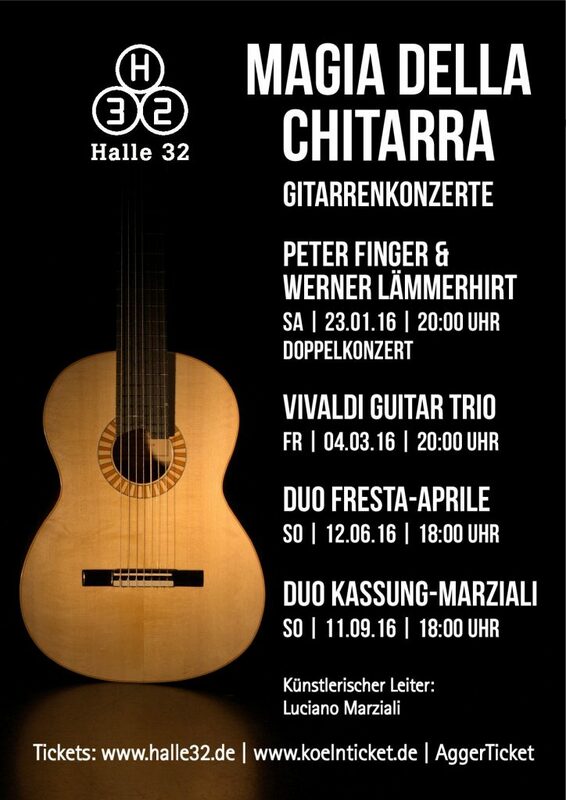 This work is targeted not only at a specialized audience but also at those who do not know the guitar as an instrument of recitals. From this perspective, Guitar TV World represents the meeting point of two worlds which seem to be far away from each other: the one of professional guitarists and that of music lovers in general. 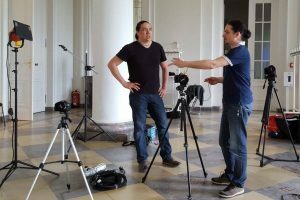 For Guitar TV World, it is extremely important to make a contribution to the world of the guitar through interviewing important personalities of the instrument, creating documentaries about guitar festivals and competitions, didactic series and many more. 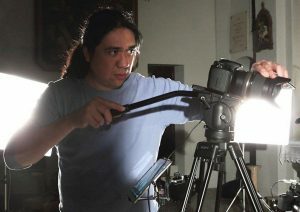 It also offers audiovisual production services for professional musicians who are interested in presenting their artistic ideas and proposals in a high-quality format. Discover together with Guitar TV World the wonderful world of the guitar!